Our bargaining committee has developed a set of initial goals based on a majority of Postdocs and Associate Research Scientists (ARS) filling out the bargaining survey for the upcoming negotiations with the administration. These initial bargaining goals are broad and inclusive to enable us to pursue a wide array of potential improvements in our first contract. Read and give feedback on the initial bargaining goals here. 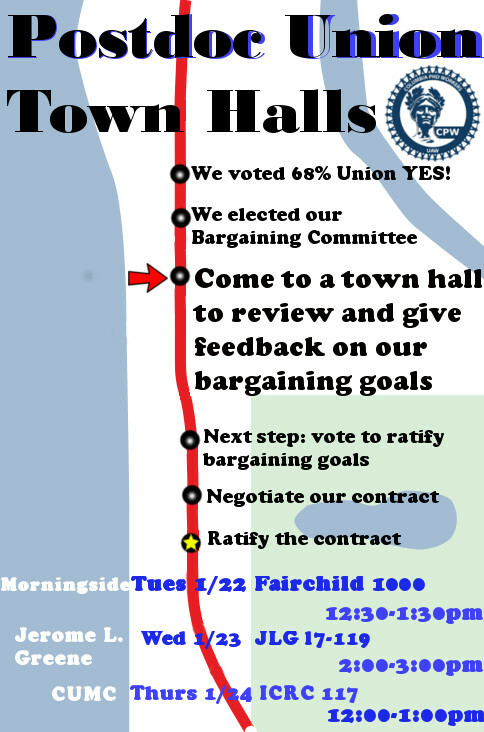 Because your voice is important we will be holding several town halls during the week of January 21st in order to discuss and further shape our bargaining goals. Lunch will be provided. Please RSVP to a town hall to give feedback on our initial bargaining platform. We will have the opportunity to vote in favor or against the bargaining goals in late January and early February before we begin negotiations.The more people that participate in this vote, the more power we will have to negotiate a strong contract. Please come to help shape our bargaining platform. We also want to encourage all interested Postdocs and ARS to get involved in our organizing committee as we move forward. We will create specific working groups (parents, international researchers, etc) to help the bargaining committee address our issues at the bargaining table. Based on experience at other universities, only with strong participation and action, will we win the kind of meaningful improvements we want for ourselves and for future researchers at Columbia. Please click here if you want to get involved to help to win a strong first contract.